Carl Celian Icahn 은 1936년 뉴욕의 Queens 에서 태어나서 그곳에서 자랐다. 제대후 바로 증권 시장에 뛰어 들었다. 1985년 항공회사인 Trans World Airlines (TWA) 를 인수하면서 financier 로 유명해졌다. (1) Chairman of the Board of the General Partner since November 15, 1990. ACF is a railroad freight and tank car leasing, sales and manufacturing company. 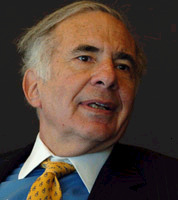 (5) Icahn & Co., Inc. since 1968. Icahn & Co., Inc. is a registered broker-dealer and a member of the National Association of Securities Dealers. a firm which holds various biotechnology patents, since 1993. 2004년 Forbes 선정, 순 자산이 76억 달러로, 미국 갑부 21위에 선정 되었었다. 1번 이혼 한 경력이 있으며, 2 자녀를 두고 있다. 이들 호텔은 American Entertainment Properties 회사에서 관리하고 있다.